Adjust all dates to your weather conditions. Click here, it takes less than a minute and your setting will last six months. The parents of Big Ben are a complicated mix of four rarer varieties of blackcurrant bushes. This variety was first released in 2013 making it the most recent of the "Ben" series of blackcurrants. This variety is a very recent introduction and is unlikely to ever be seen in your supermarket because it has been bred exclusively for the Pick Your Own and home garden market. The berries have an average weight of about 2.3g which compares well to the average of 1.1g. At the same time the berries are very sweet with an average Brix rating of 13. This makes Big Ben one of the very best for eating fresh from the bush, better even than Ebony. The berries have good depth of flavour when cooked making this an excellent dual purpose fruit. Plants grow to a height and spread of 1.6m (5ft) with an upright growth form. The plants begin to crop quickly and reach their full cropping potential after only three years although year two will also produce a very decent-sized crop. Expect the plants to crop well for 10 to 12 years. Disease resistance is good especially to mildew and leaf spot. 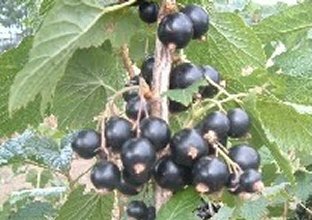 As with all blackcurrants, Big Ben is self-fertile and will produce good a crop if grown alone. This is a reasonably common variety and can often be found in UK garden centres and almost always in a good number of online fruit specialists. Bare-rooted plants, available from November to early March, are the cheapest way to buy any blackcurrant bush. The cheapest reliable supplier we could find was Crocus, click here to go to their page. Expect to pay anywhere between £6.00 to £12.00 depending on the supplier. Blackcurrant bushes are particularly prone to viral infections and for this reason we would avoid buying them from online general retailers such as as Amazon or E-bay unless you know exactly who is supplying them. Cuttings donated by friends are of course free but we always ask to see the parent plant to check that it is free from disease. Buying blackcurrant bushes from the discount stores can be a good deal but it can also result in a sub-standard crop. The discount stores take the second quality plants whereas the more conventional suppliers take the best quality. Unfortunately you will only find this out after you have carefully tended your crop for two years when they fail to crop well. We have four pages devoted entirely to planting, care, harvest, pest / disease and propagating blackcurrants which can be found here. SPECIAL FEATURES: The taste, for eating fresh, is quite simply the best and it also cooks well. Very large berries.